When I'm in Berlin I'm often traveling from meeting to meeting or from Mitte back home to Kreuzberg. I prefer to cycle but some days the weather or distances don't really allow it. On those days I use vehicle sharing. In large cities like Berlin, London or New York (and to an even greater extent in their EM cousins Beijing, Sao Paulo, Cairo, Jakarta…) cities can be frustrating and expensive to travel within. Many people criss-cross their cities 3 or 4 times a day. All three of these methods of urban mobility have been around at least 100 years (and for a more general take on mobility read this post by my colleague Nicolas). What I want to talk about here briefly is the fourth mode, and in particular flexible vehicle sharing, which has only really been around in its current form since 2008. The distinction between flexible and fixed vehicle sharing is important. Fixed schemes have been around longer (like Zipcar's traditional service) and allow you to rent a car from a fixed location but require you to return it to that same location. These schemes are useful if you want to take a trip from A>B>A, like heading to IKEA to buy furniture. Flexible schemes on the other hand are far more useful, because they can be used for any trip from A>B (as long as both origin and destination are within the scheme's geofencing zone). 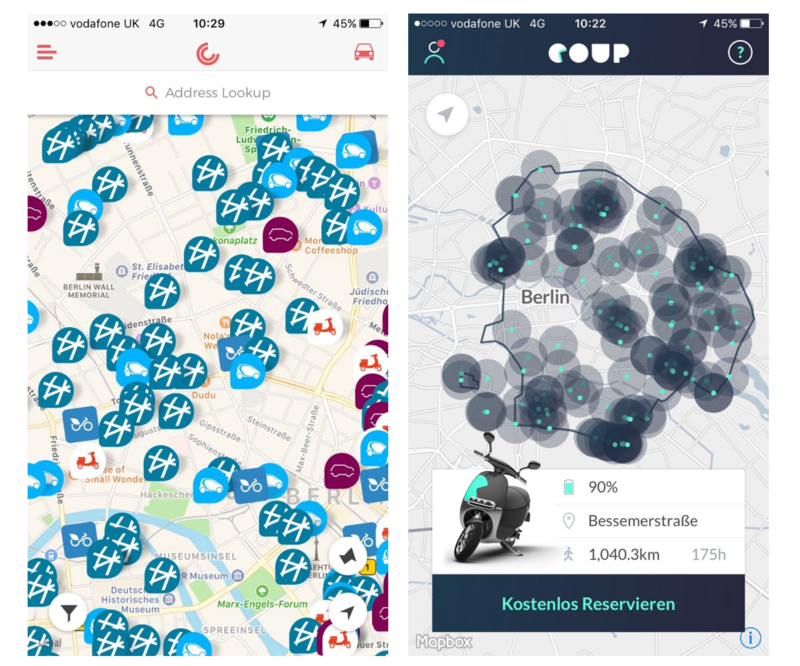 Berlin is one of if not the global capital of vehicle sharing. I'm aware of at least 12 different vehicle sharing schemes in the city. My estimate is that there are close to 3,000 free floating vehicles in the city (Car2Go with at least 1,000, DriveNow with 800 ..etc) What this means in practice is that I almost always find a vehicle within a 5 minute walk, and more often than not within 3 minutes. These services are cheap. Car2Go costs on average €0.30 per minute meaning a 10 minute ride puts you back roughly €3.00. DriveNow is marginally more expensive at around €0.33 per minute, and the scooter sharing services are even cheaper with eMio at €0.19 per minute or COUP at a flat €3.00 fee for a ride up to 30 minutes. To put that in perspective a single ride on the u-bahn (subway) costs €2.70. So there are major savings here vs. uberx, on the order of 40% (DriveNow) up towards 75% for scooter sharing services. When I have the flexibility and ease-of-use of a private vehicle on hand within a 5 minute walk at the push of a button, the attraction of owning and maintaining my own car has just fallen through the floor. Of course, flexible vehicle sharing schemes are not right for every city. It's hard to see the scheme working well in an urban environment as dense as Manhattan with stringent parking regulations for example. Berlin is in a sweet spot where it is dense enough to make the schemes economically viable but not so dense where parking becomes a nightmare. London is another good example. DriveNow is live in London in several boroughs like Islington and Hackney where the population density and parking environment is similar to Berlin's. One of the reasons why I'm excited by this space is because I do see these schemes as having advantages as we move towards autonomous vehicles. The primary difference between ridesharing and carsharing today is the driver and when driver's start becoming optional the distinction between these two categories will start to dissolve.